The use of Adaptive Design in clinical trials has received a lot of attention over the past few years, with many advocates evangelizing for its potential benefits to both patients and drug developers in identifying new cures in a faster and more efficient manner. But it hasn’t seen the uptake many expected. The FDA has been proactive in working with pharmaceutical and biotech companies in providing background on how to consider adaptive design, and a draft guidance was issued in 2010. In a recent article, several representatives from the FDA’s Center for Biologics Evaluation and Research gathered data on their experience with adaptive design. In “CBER’s Experience with Adaptive Design Clinical Trials”, Lin et.al. present a summary of the types of adaptive design proposals before and after the 2010 FDA draft Guidance document on adaptive design in clinical trials. They scoured the CBER electronic document room for all proposals submitted that had any adaptive components to them between the years 2008 and 2013. Among the 12,095 submissions, 1,225 required formal statistical review. Among those, 140 had adaptive elements. The authors break down those submission by adaptive design subtypes of dose-finding, adaptive randomization, group sequential, sample size re-estimation, two-stage (seamless and non-seamless). They also provide other breakdowns by study phase, therapeutic area, outcome type, etc. In a plot of the number of proposals with adaptive designs by year it shows the number increasing until 2011 and then decreasing to the level it was at in 2008 by 2013. My own experience and communication with colleagues suggest that the 2010 draft guidance did a great deal to clarify the FDAs level of comfort with adaptive designs. In the draft guidance some of the newer and possibly more aggressive types of adaptive designs were described as “less well understood”. This probably caused industry statisticians, who are generally a conservative bunch, to shy away from such designs. 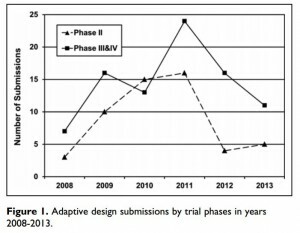 Another consideration in the decline in the number of adaptive design submissions could be the increased scrutiny they receive at the agency, leading to longer review times and more back and forth with sponsor/FDA interactions. For example, some of the seamless phase II/III Bayesian designs don’t always provide a transparent explanation of how the overall Type-I error rate is preserved. Thus, additional calculations may be requested that would lead to increased time from submission of a proposal to the time the FDA is comfortable with it. Nevertheless, the authors provide excellent suggestions for how to address the questions the FDA will have about adaptive designs. This article is an important survey of the impact that the 2010 draft Guidance Document on Adaptive Design in Clinical Trials has had on industry’s enthusiasm for adaptive designs. Incorporating their excellent suggestions into adaptive design proposals should lead to a greater level of comfort at the agency with some of the newer types of adaptive designs. 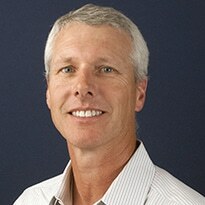 FULL CITATION: CBER’s Experience With Adaptive Design Clinical Trials. Therapeutic Innovation & Regulatory Science. 2016 Feb 22.